Hail, Abraham's God and ours! One mighty hymn we raise. This text is based on a Jewish doxology of thirteen articles formulated by Moses ben Maimon (Maimonides) in the latter part of the twelfth century. A fourteenth-century metrical version of that doxology, Yigdal Elohim ("magnify the Lord"), is traditionally used in daily morning synagogue services and during the Sabbath eve in Jewish family worship. That version is variously attributed to Daniel ben Judah or to Immanuel ben Solomon, both of whom lived in Rome. After hearing the Jewish cantor Meyer Lyon sing this Yigdal in the Duke's Place Synagogue, London, England, Thomas Olivers (b. Tregynon, Montgomeryshire, England, 1725; d. London, England, 1799) prepared an English paraphrase in twelve stanzas (around 1770). About his paraphrase, Olivers reportedly said, "I have rendered it from the Hebrew, giving it, as far as I could, a Christian character, and I have called on Leoni [the cantor Lyon] who has given me a synagogue melody to suit it." Orphaned at the age of four, Olivers was negligently cared for by various relatives and received very little formal education. He worked as a cobbler but lived such a scandalous life that he was forced to leave his hometown. However, his life changed drastically after he was converted by a George Whitefield sermon on the text "Is not this a branch plucked out of the fire?" (Zech. 3:2). At first a follower of Whitefield, Olivers joined John and Charles Wesley (PHH 267) in 1753. He served as an itinerant Methodist preacher, traveling one hundred thousand miles on horseback through much of England, Scotland, and Ireland until 1777. He became editor of the Arminian Magazine in 1775, but John Wesley dismissed him in 1789 because of flagrant printing errors and the insertion of articles that Wesley did not approve. 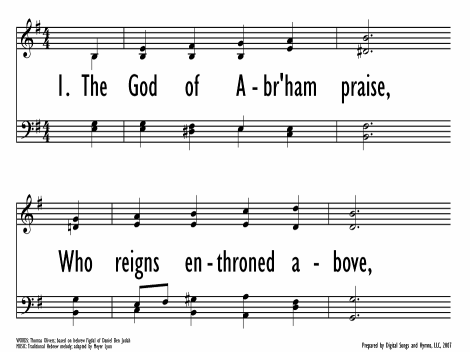 Olivers wrote only a few hymns, of which "The God of Abraham Praise" is most well-known. His text with Leoni's tune was published as a leaflet, "A Hymn to the God of Abraham," in 1772. 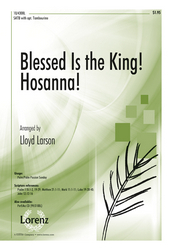 The hymn was also published by John Wesley in his Sacred Harmony (1780) and in 1830 in Joshua Leavitt's popular American frontier hymnal The Christian Lyre (PHH 171). It appears in most modern hymnals (but should not be confused with another hymnic translation of the Yigdal that begins, "Praise to the living God," by Max Landsberg, Newton Mann, and William Gannett). The Psalter Hymnal includes Olivers' stanzas 1, 4, 6, 7, and 12 in a modernized text borrowed in part from Hymns for Today's Church (1982). Like the Yigdal, this text begins by praising God for his sovereignty and faithfulness to his people (st. 1-2). God gives his people a land "of milk and honey," an image that becomes a rich eschatological metaphor for the new creation (st. 3-4) in which angels sing "Holy, holy, holy," and all creatures join in praise to God (st. 5). Olivers appended many biblical references to the margin of his text. The primary ones for these stanzas are Exodus 3 and the great doxologies in Revelation 4, 5, and 7. As a monumental hymn of praise, especially at the close of a service; with eschatological preaching; during Advent. Named after the Jewish cantor whose performance of the Yigdal inspired Olivers to write this text, LEONI is the second of the seven historic Jewish melodies associated with the great Hebrew doxology, which were handed down orally from one cantor to another. Olivers adapted Lyon's version for congregational use. Known also by his liturgical name, Meyer Leoni (b. London, England, 1751; d. Kingston, Jamaica, 1797), Lyon was a tenor at the Covent Garden and Drury Lane theaters in London and a cantor in several synagogues, including the Great Synagogue in Aldgate. LEONI is a magnificent tune with lots of life and vibrant rhythms. Sing the outer stanzas in a full-voiced unison and the middle ones in harmony at a more moderate volume. 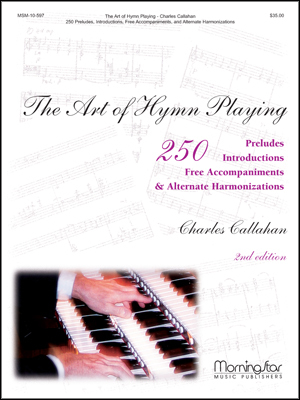 The harmonization is taken from Hymns Ancient and Modern (1875). Because the Yigdal was traditionally sung in responsorial fashion, antiphonal singing might be appropriate.